I should have sent this email earlier but Greg and I have been exhausted. Our son, Nathan, was born on his due date, Friday, July 9th. He weighed 6 lb 10 oz and was 20″ in length. He had perfect apgar score and was 100% healthy. We couldn’t be any prouder with our new bundle of joy. 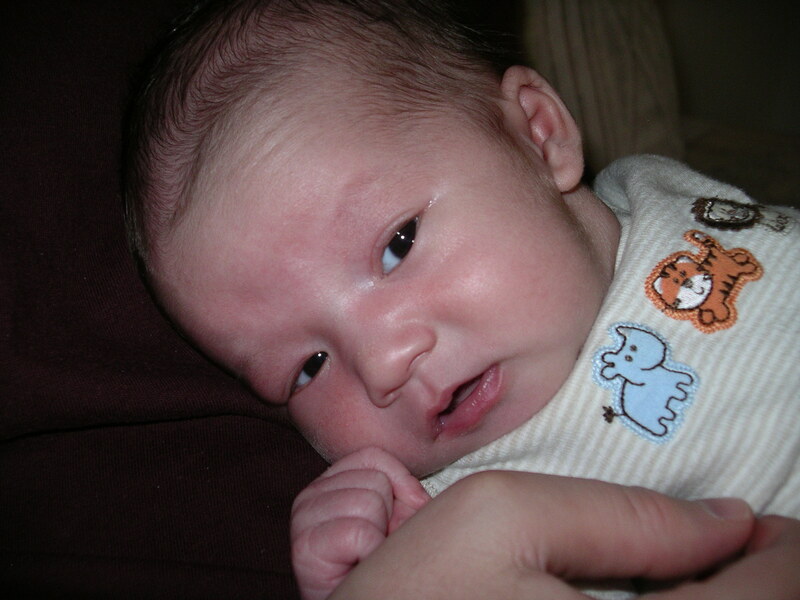 Attached are a few pictures we took when he was born. 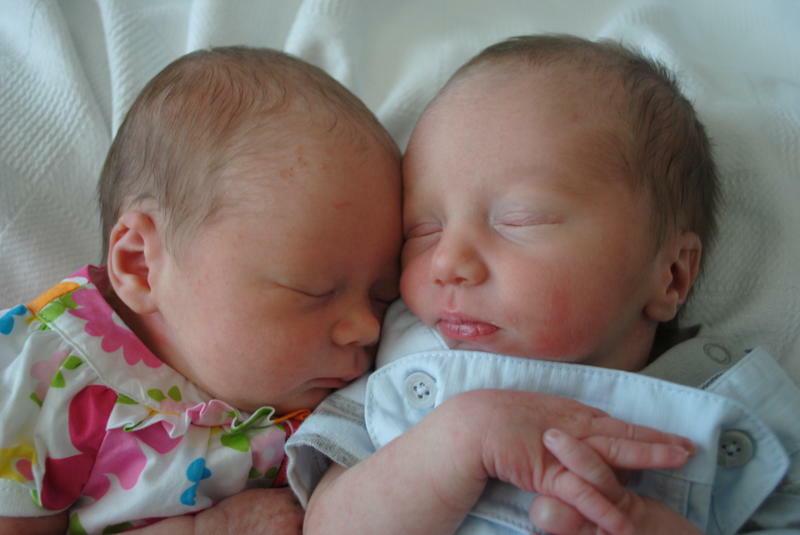 As far as the birthing process, Hypnobabies worked great for us and it was a very positive experience. I am somewhat disappointed that due to circumstances out of our control that we didn’t get the birth we have envisioned for so long. I am putting my birth story in this email but please don’t read if you think that stories about not having the exact birth you envisioned would have negative impact on you. I just wanted to share my experience and I wish the best of luck to everyone. It all started on Wednesday, July 7th when I woke up around midnight to use the bathroom and saw some blood. I didn’t think much of it and went back to bed. I woke up a few times that night which wasn’t unusual, especially during the last few weeks of my pregnancy. I got up in the morning and decided to work from home instead of going in. I felt the pressure waves coming and going but I thought those aren’t real pressure waves since I didn’t have problems talking through them. Greg and I decided to do some last minute shopping for the baby and went out for lunch. I continued to have pressure waves but they were so manageable that I didn’t think they were the real thing. I put in a full day of work in between pressure waves and that night the pressure waves came so much closer together than Greg decided we should time them. They were about 3.5-5 minutes apart and we decided to go to the hospital. ***SPOILER*** This is the part where our plan deviated. The progress of my pressure waves slowed down when we were at the hospital. After my water broke, somehow the umbilical cord was in a sticky position where it got pinched and the baby’s heart rate dropped dangerously low. In order to ensure the baby was ok, we went through an emergency C-section. I didn’t get the birth I had envisioned but I must say that I wouldn’t have done anything differently. My ultimate goal was to have my baby in my arm all safe and healthy and I accomplished that. Hypnobabies techniques worked great during the time I was having the pressure waves and if not for the problem with the baby’s heart rate, I am convinced that we would have a very successful birth. I am proud of what we have done during the time we were in the hospital. I am actually surprised how easy and manageable the whole process was and both Greg and I were amazed with the new found strength I have in me considering I was not able to stay awake for any single sessions we have had. I would have written the email a lot sooner if we are not struggling with breastfeeding. For some reasons I am having problems producing enough for our baby and we ended up hiring a lactating consultant. Things have improved but still not quite where I could successfully breastfeed without the need for supplement. Anyway, we are still getting into the groove of being new parents and so far we learned a lot about ourselves and our baby. We hope you guys have the best of luck and have the birth of your dreams. 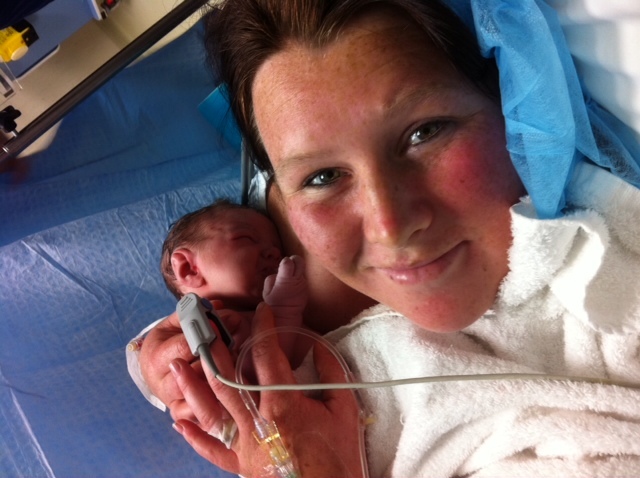 Wonderful powerful post about skin to skin after cesarean! OB nurse shares her experiences about helping moms make this happen. 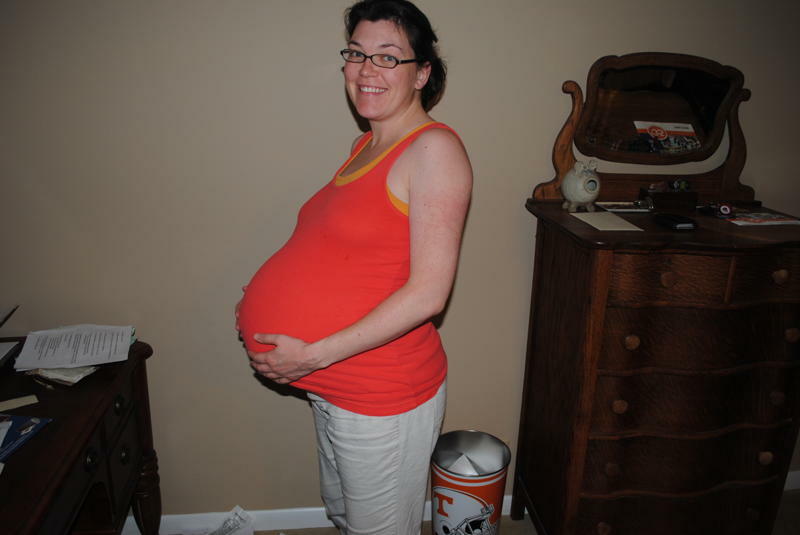 From around 38 weeks, I began experiencing significant birthing waves off and on. A few times, I felt like my birthing time was approaching, got in a bath and listened to my birthing guide tracks and the baby come out track. I felt so close to Seth then, I knew he would be with me soon and every wave was complete pleasure. I felt ready for my birthing time. The waves would subside after some time though, and active labour did not come. After my “guess date”, I began to do some major work on releasing any remaining fears about birth and parenting, and saw that each day I would let go of more controlling and fearful thoughts and become even more ready for my role as parent. By the time Seth’s birthing day came, I had completely let go of how I wanted things to go and accepted that I had done everything I could to provide Seth with a beautiful, natural birth. Everything else was beyond my control. This work of letting go and allowing for nature and the universe to take over was the most essential benefit of my hypnobirthing / hypnobabies work. I had spent months practicing diligently for my perfect birth, envisioning and willing things to go a certain way, and this was all important, but ultimately the greatest lesson was knowing that no matter what happened, I could stay calm, relaxed, present and welcoming to whatever was in store. “I calmly accept whatever turn my birthing may take” and “My only job is to relax and allow my baby to come to me” were wonderful affirmations I turned to often. At 40 w 6 days, my midwives booked an ultrasound for me to make sure things were going smoothly, and if so we would wait until around 42 weeks for birth to begin naturally. After the ultrasound, a most sensitive and wonderful OB came into the room and informed us that my fluid was quite low and that as much as she respected that I would want a natural birth and would prefer to let things start on their own, she strongly recommended that we “get on with things” as soon as possible to ensure the safety of the baby. I cried as this was always my fear, having to make such a decision. How do I really know whether my baby’s health is at stake? Well, DH and I decided that we would in fact induce in a very gentle way in the next day or two if this is what my midwives recommended as well. I have wonderful midwives who respect the natural birthing process and would not recommend induction before 42 weeks unless absolutely necessary. Any concerns I had about whether this was necessary were put to rest when I spoke to my back-up midwife (my main was off call until 10 pm) who is incredibly anti-intervention, and she suggested we induce as soon as possible! She didn’t even want to wait a day. She said to go home, have something to eat and get our stuff and meet her at the hospital in 2 hours. At this point I was able to put aside any regrets about things not starting spontaneously and just got excited that it was now my birthing time! I would be meeting Seth very soon! At the hospital, things did not look great. I had been getting birthing surges all day, and was put on a fetal monitor to check things out and determine the best way to start induction. It was found that my baby’s heartbeat was dropping with each surge, and this was concerning, as it was not certain that the baby would be able to withstand labour. At this point even more letting go was necessary, as my midwife warned that a C-section could be possible if things did not improve. Again I was disappointed, but all my work in accepting whatever turn my birthing would take and staying calm and relaxed no matter what came in tremendously handy. The decision was made to begin with cervadil, and to see how things progressed. The contractions got more intense quite quickly, and as I stayed calm and relaxed and listened to my hypnobirthing / hypnobabies tapes I got into a great groove of riding them out. Lo and behold, my baby’s heartbeat started to stay steadier throughout the contractions! Seth and I were well on our way to his beautiful birth. As I was only 1-2 cm dilated, midwife and OB thought things would take around 12 hours to really kick start. I would stay at the hospital but both my midwife and husband went home to get some rest before things would really get going. Good thing my mom decided to come stay with me even though I told her not to! After about 3 hours, my birthing surges were so powerful it took all my strength to stay with the “anesthesia” and ride them out. It really felt like pressure, but so much! It was very intense and the waves were not really subsiding for more than a few seconds. I went on all fours, rocked on a birthing ball, moved my hips and did whatever my body called on me to do to ride them out. Soon enough though I began to feel that something was off, I was just not getting enough rest time between the surges. OB came in and saw that it was getting too much, so we took out the cervadil and broke my water, I was 3-4 cm dilated already! I called my midwife and husband and told them to come right away, it seemed like things were really progressing fast. From then on I laboured naturally and beautifully for about 7 hours throughout the night, walking around, using the birthing ball, leaning against a wall or my husband and rocking my hips. My DH and midwife were such incredible support, we listened to hypnobirthing / hypnobabies tracks out loud and they were with me through each birthing surge. My husband rubbed my back, touched me and encouraged me so perfectly and I felt so connected with him and this beautiful moment. With each surge I felt my baby’s head come down, I envisioned a lotus flower opening and my baby coming through. The waves were incredibly intense but it was beautiful. And I was getting some rest in between so it was much more manageable than with the cervadil. At this point my midwife started to get concerned with baby’s heartbeat again. It looked like it was dropping with each birthing surge again, and would not stabilize. I had to then stay on the fetal monitor the whole time, and lying on my back made it really difficult to ride out my birthing waves. I got examined at this point, and was still only 5 cm so it looked like I would have a ways to go. I began to consider an epidural, since the thought of labouring on my back for much longer was becoming unbearable. It was amazing to be able to consider this possibility without fear or feeling like I would be failing in some way, I simply accepted that whatever felt right intuitively would be the right decision. After discussing with my midwife, we saw that it seemed like it would be the right choice at the time. I was getting exhausted and finding it harder to stay relaxed, and this was making things more difficult for both my baby and me. We thought that an epidural would help me relax and perhaps allow for the baby’s heartbeat to stabilize. I decided to go for it. The anesthesiologist was wonderful and although the process was a bit scary it felt like it was definitely the right choice. Almost immediately I got some relief, and we kept the epi at quite low so I could still feel what was going on. It was great to be able to relax again and stay on my back. We continued like this for an hour or so, but baby’s heartbeat failed to stabilize. OB came in for a consult and recommended we just wait and see, I was about 6 cm by now so hopefully we could continue with a vaginal delivery. As some of the drops in heartbeat got lower though, the decision was made to give me a different monitor for the baby that was more accurate, that would attach to the baby’s head. This is when things got really critical, because once we tried to attach it we lost the baby’s heartbeat for a few seconds. This was so scary, I thought we were losing the baby. There was quite a bit of panic and both midwife and OB suggested we go for a C-section, it really appeared that the baby would just not be able to take labour anymore. I decided to go for it. At this point I felt so much acceptance, confidence and respect for both the natural order of things and grateful for medical intervention at times when it is necessary for the health of mom and baby. I was scared and shaky as I was rolled to the operation room, but felt supported by the universe and by so many kind, great people who were committed to the best outcome for both Seth and I. My husband came in with me and sat next to me throughout the quick operation, and soon enough we heard Seth’s first cry. I have never felt or heard anything more beautiful in my whole entire life. When I saw him I couldn’t believe the little miracle that had come from my body. And he was so healthy and perfect, I couldn’t have been more grateful. Dad held Seth as they finished up the operation and cut his cord, and within minutes Seth was on me and we were bonding beautifully. I was able to breastfeed quite quickly after, and felt such an instant connection to this amazing new person that has entered the world. Although I did not have a natural birth, the spiritual journey of being able to accept and allow what I once most feared (a surgical birth) was more enriching and rewarding than any birth I could have ever imagined. Hypnobirthing and hypnobabies gave me the courage to know that I always have a choice, and I can always choose to stay calm, focused and positive no matter what the situation. In the operation room, I told my husband that I felt so lucky have been able to experience so many things in one birth! Induction, natural labour, epidural, surgical birth… and to stay connected to my baby and the process throughout. I told him it had been the perfect birth, and so it was. I’ve learned that what happens in life is exactly what needs to happen at any given time, and we are so much richer for allowing these experiences in and letting their beauty and wisdom enlighten us. I can’t wait to see what other adventures and wonderful lessons Seth brings into my life.